Gorgeous European girl gladly answering the phone call, then looks through the window and putting down the phone. Modern communication, portable devices. Technology. Comfortable café’s interior. Close up view of gorgeous blonde girl in a casual wear texting online in the café. Fashionable outlook, red lips, leather jacket. Modern lifestyle. Using devices and gadgets. Online communication. Close up view of a young lady in nerdy glasses, gladly using her phone. Being online, using wifi. 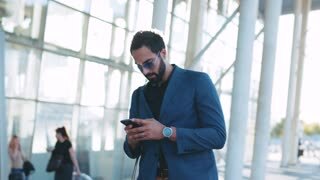 Attractive man in a casual suit passes by the airport terminal and uses his phone, gladly replies to the received message. Passengers with luggage on the background. Rotation close up view of gorgeous young brunette woman gladly using the phone, smiling to it, stroking her hair while standing outside. Positive emotions, cheerful mood.